There are many previously published Practical eCommerce articles about site search. They include tips about features that are critical to delivering a world-class customer experience. Review them and learn more about both technical details of site search and leveraging reporting to deliver better results. You should also regularly compare your site search objectively to the stores you compete with. If your search is not on par with others, you are losing sales to someone. It may be that shoppers just leave when they don’t find what they want. Or, it may be that your average order size is lower than it could be if shoppers could easily find more items they are looking for. Search is one of the top two or three features in your online store — others being your home page and shopping cart — but site search is frequently an afterthought for shopping cart providers and merchants. If you are like most online stores, your search results page will have either the most page views or be second to your home page. You need to be sure to deliver relevant results in a presentation that is easily browsed and refined to find exactly the items your shopper is searching for. Almost all of the top Internet retailers incorporate the following features into their site search. Guided search and navigation. The ability to filter search results by different attributes without delivering a dreaded “no results” response. This might include things like brand, color, size, gender, and price. Search suggestions. Also known as “type-ahead search,” provides relevant suggestions that generally appear below the search box as you type. Synonyms or thesaurus. The ability to create related terms that will deliver the same results. In the example below, you may choose to have sandals also deliver results for flip flops. This may also handle misspellings in some search tools. Relevance ranking. This feature allows merchants to define the sorting order by options like best sellers, profit margin, price, or brand. It falls into the merchandising category but is an important feature to improve the customer experience. User defined sorting and presentation. Empower consumers to choose the sorting order and how many items show up on a page. Some tools allow for the user to choose different presentation layouts as well. Keyword redirection to relevant landing pages. This is an important feature for merchants that develop a high number of landing pages based on keywords. Frequently used for “brands” to include promotional banners, best sellers, and other merchandising not available in all standard search results. 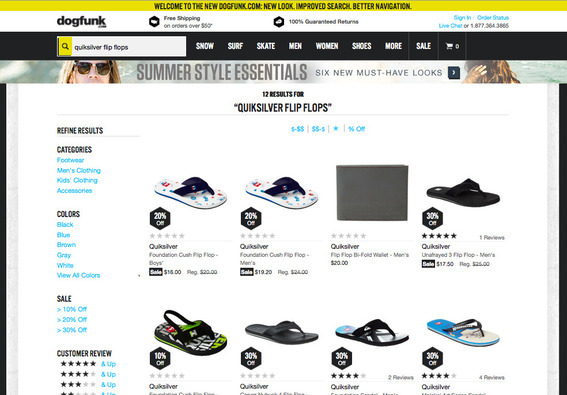 In my example below, several sites have a landing page for “Quiksilver flip flops,” but I get a more standard results page when I search on their sites limiting the merchandising opportunities. Unfortunately, shopping carts still don’t include most of those site-search features. Beyond the shopping carts inadequacies, many web developers and merchants do not invest the level of resources required to build the search results pages and product content that will lead to high rates of conversion. With many search tools, delivering high value search results requires adding attributes or tags to products for things like brand, color, size, gender, ratings, and so forth. Here are a few examples of good site searches and a few that are lacking. 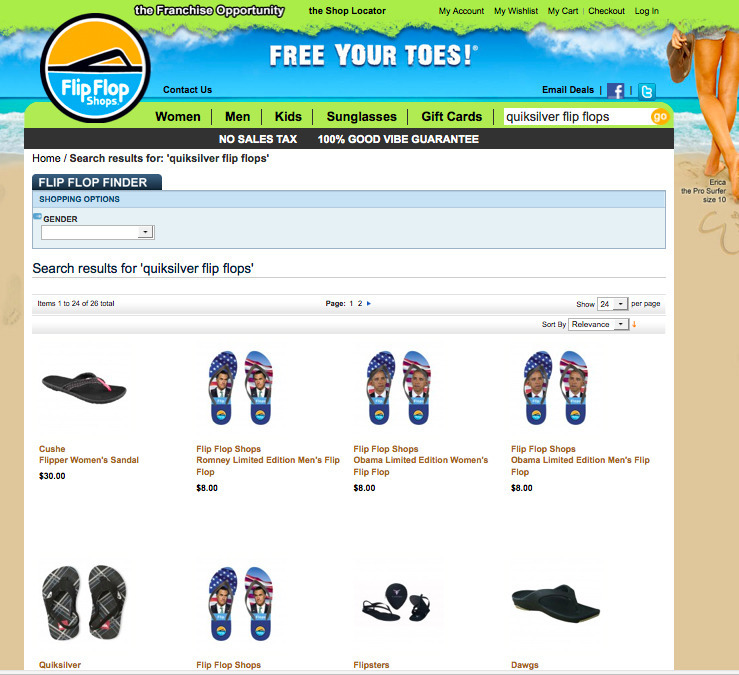 I first searched for “Quiksilver Flip Flops” on Google and chose to do further searches on the top organic sites. 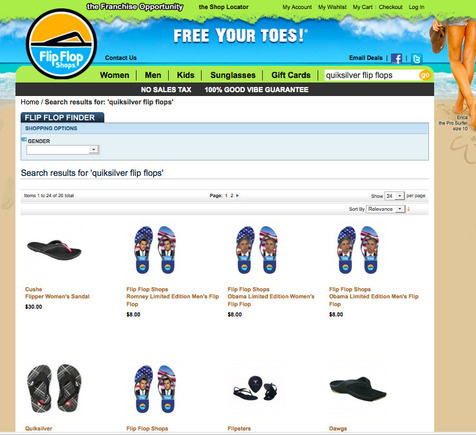 In many cases, the Google results were linked to a Quiksilver landing page for flip flops. I went ahead and did the same search within each site to evaluate its site search versus its marketing savvy. Here is Quiksilver’s site search. The Good: Quiksilver has a nice promotion at top of page and a nice presentation of design patterns. Quiksilver has filters available by price and size and user defined sorting. The right column includes best sellers in that category. The Bad: Not much is bad in Quiksilver’s search. One annoyance is the term I used for search disappears from the search box so I have no way to remember what I searched for. Also, the white space around the photos seems awkward. Here is Zappos’ site search. The Good: Zappos offered many different filtering choices to narrow my search, including color, materials, theme, pattern, and accents. 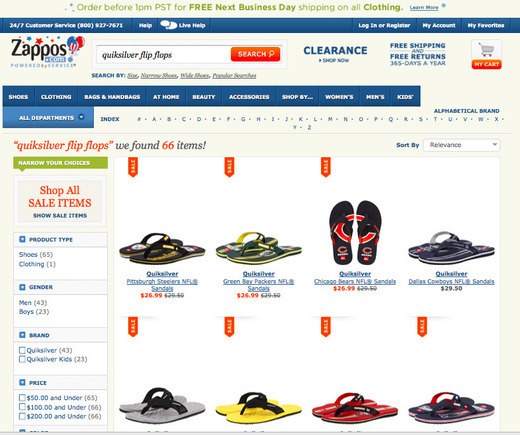 Zappos offers user-defined sorting and returned very fast search results. Breadcrumbs are clearly visible to see what filters are currently applied and Zappos displays only the Quiksilver brand. The Bad: Nothing in particular is bad with Zappos’ site search. I always dislike the confusing “Sort by relevance” option. What does that really mean to a shopper? As an experienced ecommerce merchant, I assume it means by profit margin. I think you should present something like “Best sellers” or “Price” rather than relevance. Here is an example from Flip Flop Shops. Flip Flop Shops’ site search. 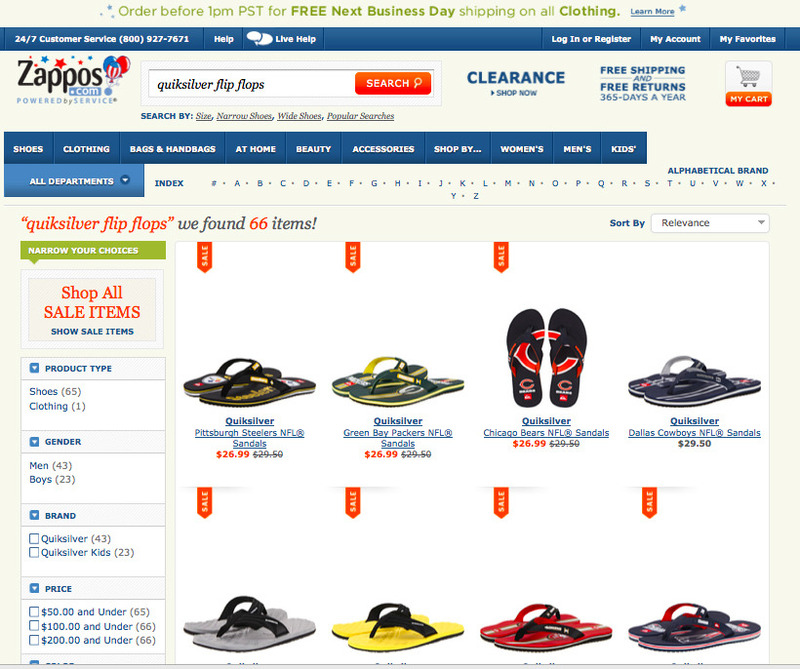 The Good: Flip Flop Shops delivers fast search results and includes user defined sort, but choices are limited to brand, name, and price in this category. 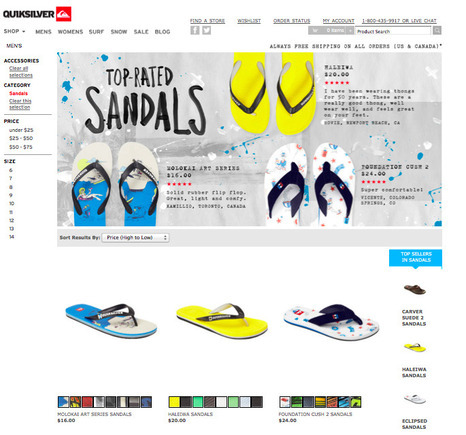 The Bad: Though Flip Flop Shops has a single Quiksilver offering, it is on the second row. Technically, the search found “flip flops,” but in this case Quiksilver should be a brand identified as a criterion of the search. The only filtering option is gender. Overall, the results seem less appealing than the other sites and does not include any merchandising features to encourage me to click through to another level if I don’t see exactly what I am looking for. Here is an example from Dogfunk.com. The Good: Dogfunk.com supports type-ahead search with many other Quiksilver items as options. The site search delivers results for Quiksilver flip flops — the results show a flip flop wallet too, but that’s difficult to filter out in even the best search engines. Dogfunk.com offers many ways to filter including customer reviews and includes ratings and promo tags in the search results and the search is fast. The Bad: It appears this search is brand new — meaning Dogfunk.com probably lost revenue prior to this upgrade. Other than that the search is well implemented. Here is an example from Tilly’s. The Good: I can refine my search by men’s or boy’s and sort by latest or price. 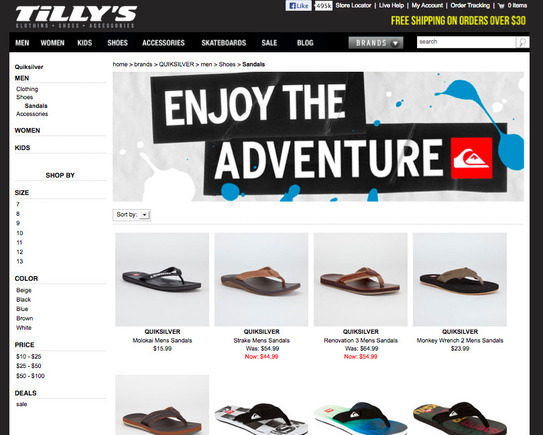 Tilly’s site search delivers only Quiksilver flip flop results. The Bad: The search results are painfully slow — so slow that I thought my Internet connection was down. I did the search several times while writing this and the speed was the same. I tried a few other searches with the same results. Also, the list of filtering options is short and hidden behind a pull down menu rather than a checkbox presentation where the options are obvious. The Better Option: Take a look below at the Tilly’s landing page you see when you click through from a Google search on “Quiksilver flip flops.” This landing page is what the search results page should look like. Tilly’s is likely unable to reproduce this in the site search tool so it must build custom landing pages. This is a frequent limitation in off-the-shelf search tools. Consumers today demand fast search results with things like type-ahead, sorting, and filtering features. Some of the other features, such as relevance ranking and synonyms are managed in the backend. Together, they deliver a rich customer experience. Review your own search and if you are not meeting these basic requirements, it’s time to upgrade. At the very least, choose some of the top search terms used in your site search and test them in your top five competitors’ stores and see how their search results compare. If you are behind the times, consider investing in an upgrade. Once you choose a search solution, be sure to invest in designing a customer experience that will take advantage of the tools. Most now include some advanced merchandising features. Some will take over your entire site navigation if you wish. Virtually all of the prominent ecommerce sites are moving in the direction of advanced site search.